This Potentiostat - Galvanostat - Impedancemeter, designed by OrigaLys Electrochem SAS is a complete solution with an attractive shape. Each instrument from OrigaLys Electrochem SAS benefits from more than 20 years background and knowledge in Electrochemistry. It works with its user-friendly software: OrigaMaster. The OGS100 performs pH and temperature measurements. 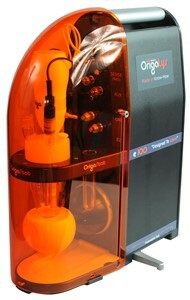 The OGS100 can also be connected to a low current probe: OrigaMµ and a current booster: OrigaBooKst. The general specifications of the OGS100 are the same than the OGS080.